Brooklyn, NY (December 30, 2018) – Police say that a driver was lucky to be alive following a two-car serious accident that ended in severe damages to the vehicle involved. The accident left a BMW SUV completely totaled with the front-end smashed in. The accident happened on Christmas morning around 4:00 a.m. when the driver lost control and was immediately involved in an accident at the intersection of Ocean Parkway and Foster Avenue. 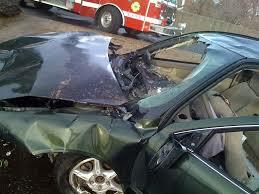 The other vehicle’s damages were not as severe. The driver with the highly damaged vehicle was able to get out of his vehicle and was transported to the hospital with a variety of injuries. However, he is expected to be okay. New York accidents take place every day on our roads due to the negligence of other parties. We would like to extend our sincerest sympathies to those involved, as a result. We understand how devastating these accidents can be on physical and financial levels and do not want you to have to stand alone. Our experienced New York accident attorneys are here for you in your time of need. At Hach & Rose, we have adopted a personal responsibility to assist those who have been affected by the reckless acts of another party. It is tremendously important to understand that you might have many noteworthy rights concerning your involvement in an accident that was due to another party’s carelessness. If you have been injured in an accident, you have many rights. Contact us for more information at 212-779-0057.